This is a simplified drawing from Browning’s patent number 747,585, which he filed on 3 April 1902 and which was granted on 22 December 1903. Fabrique Nationale (FN) built this gun in 9mm Browning Long. Colt built a slightly smaller version in .32 caliber and later .380 caliber. It became one of the most copied pistol designs in history. 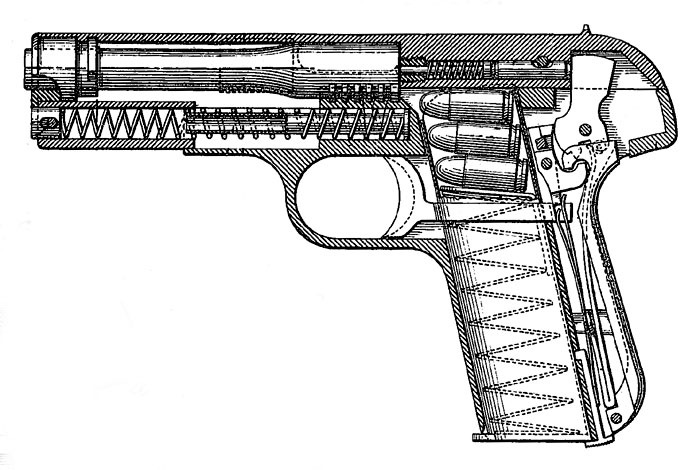 This was the basic design which was miniaturized in order to produce the 1906 FN Browning and the 1908 Colt Hammerless. The hammer was eliminated in favor of an inertial striker.